Coach Julia joined the Mr. Blue family in October of 2015. She currently attends Broward College as a dual enrollment student and will be graduating in 2018. She plans to continue at Broward College to pursue an Associates of Arts degree and then transfer to an Interior Design college. 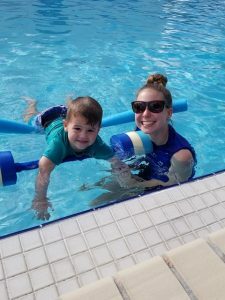 She first joined Mr. Blue as an office staff, but saw the connection between our instructors and their students that she decided to wanted to be trained as an instructor. She came to Mr. Blue seeking a job because she wanted to work for a company thats in the business of preventing drownings. Her brother had a near drowning experience and if it wasn’t for their police officer neighbor quickly jumping into action her brother may have drowned. Julia loves what she does because she knows everyday she is helping prevent drownings.